Recently Family Christian sent me the DVD When the Game Stands Tall to review. 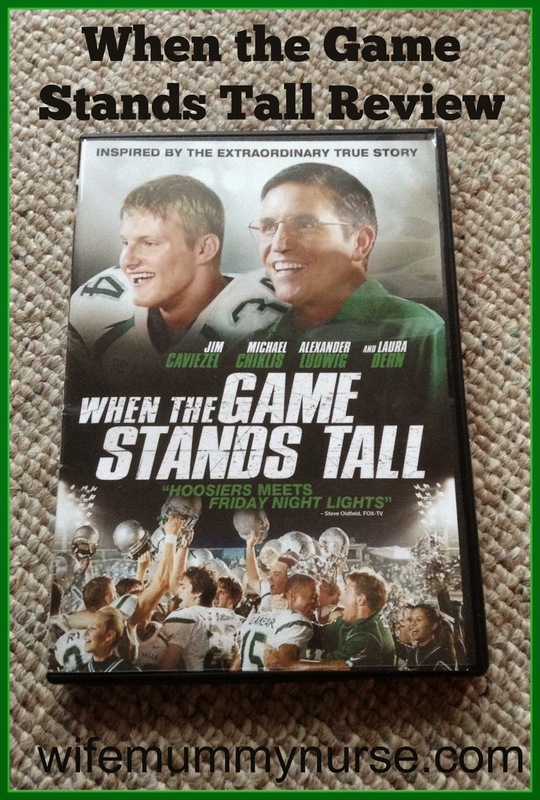 Synopsis: When the Game Stands Tall is based on a true story about 151 game winning streak by De La Salle high school. Coach Bob has a heart attack. He came to the realization that he had been a lousy father. Terrance Kelly (one of the team mates) is gunned down and murdered in cold blood. Losing the streak at Bellview. Chris Ryan, one of the players, has a chance to break California's record for highest number of touchdowns. Run time: Approximately 115 minutes. Rated: PG for thematic material, a scene of violence, and brief smoking. Coach Bob: "The streak was never our goal." The media, community, parents, and players were so wrapped up in keeping the streak that they played for their own glory. He tries to teach the team to be there for each other. When the team lost the winning streak, Bob took his team to a VA recovery ward, where one of the veterans said that it's the guy next to you that matters. Chris Ryan: At the last game of his high school career, he has the opportunity to go for the record, but he realizes he does not want his last play to be by himself. If you have a son or daughter playing sports, this would be a good movie to watch with them. Playing a sport can be good and teach important things, such as being a team player, but this movie helps reinforce that sports are not everything. I was sent this DVD from Family Christian for the purpose of review. All opinions are mine, and I was not compensated in any way. We loved this movie! Thanks for reviewing this! Such a great movie! I loved it! There are some free Redbox codes available - I'm going to use one to rent this! I love the fact that it's a clean movie that I can watch with my kids! Purex® PowerShot® Detergent - Flip, Dose, Done!